Environmental studies or environmental science (ES) majors study a broad range of topics and may have several types of professional options. If you are a student in these fields, you'll need the scientific aptitude to understand and apply complex concepts in biology, chemistry, geology, and physics and will learn to apply both quantitative and qualitative analytical skills to solving problems and interpreting research data. Your creativity will be tapped as you design research models to study environmental issues. Your ultimate career path will depend on the unique configuration of skills, interests, and values you bring to the table, but it will help if you are passionate about topics like sustainability, conservation, ecology, global warming, and alternative energy sources. Organizations of all kinds need to prepare environmental impact studies when they are planning to develop virgin land or use currently developed land for an alternative purpose. 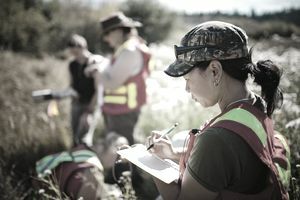 As an environmental consultant, you'll use analytical tools to assess how development projects might impact the water, soil, air or wildlife in the area. When problematic impacts are identified, you will suggest ways to ameliorate the potential effects. In other cases, you might be brought in to address existing problems—like pollution—and to recommend solutions. You'll tap the writing and presentation skills honed as an ES major to compose technical reports and deliver recommendations to clients. ES majors gain a broad-based perspective on environmental issues which can serve you well as an environmental educator. You'll need to digest available information to learn about the environment surrounding your geographic area of practice and rely on your training to collect and interpret information and to conduct fieldwork. It's important to convey a sense of excitement in your interactions with visitors or students, and public speaking skills polished on campus will help you provide dynamic presentations. Environmental organizations need to influence public perceptions to gain political and financial support for their initiatives. As a public relations specialist or communications staff member, you'll use the knowledge acquired as an ES major when generating press releases about programs and activities at your employer's or client's organizations. You'll use writing skills cultivated through your ES studies to develop content for the websites of environmental entities and to help compose text for fundraising brochures and letters. If you choose to go to law school after earning your ES degree, your scientific knowledge will be an asset when working with clients on environmentally related cases. You'll interview expert witnesses like environmental engineers, biologists, chemists, and other environmental scientists as they prepare and litigate their cases. You'll need to interpret scientific material and evaluate the validity/reliability of those findings. As an attorney, you'll rely on the writing skills developed as an ES major to compose legal briefs and other documents. You may help draft the language for environmental regulations if you work for a governmental entity. When technical solutions are required to resolve problems with environmental contamination or pollution, environmental engineers often are called upon to propose and implement those systems. In this role, you'll draw upon knowledge of environmental science when designing environmental technology and tap the quantitative skills developed as an ES major when calculating the physical dimensions of systems. You'll be expected to write proposals for projects and present recommendations to clients that show you've researched and defended a position, collaborated with other professionals, devised solutions and presented them in a clear, concise way. Organizations of all kinds are seeking greener ways of carrying out their functions. As a sustainability specialist, you'll assess the environmental practices and impact of an organization and recommend and implement strategies to conserve resources and limit environmental damage. Knowledge of scientific methodology is essential to carrying out sophisticated assessments of the impact of current operations on the environment and determining what conservation benefits are derived when alternate processes are implemented. You'll tap the writing, presentation, and interpersonal skills developed as an ES major to write proposals and urge colleagues to adopt alternative practices. Expect to plan and organize projects to implement solutions. To effectively target prospective donors for contributions to environmental causes, fundraisers must have a solid understanding of their organizations' goals and operations. As an ES major, you are well positioned to gain this knowledge and convey the benefits of supporting environmental initiatives. You'll rely on solid communication skills to compose letters and make pitches to prospective contributors, and you must be well organized to orchestrate fundraising events and plan campaigns. Generating realistic proposals for environmental policy requires an in-depth knowledge of scientific concepts. As an ES major, you should possess the aptitude for learning new scientific information as well as a solid foundation in biology, chemistry, and physics needed to fulfill this role. Your research skills will help to uncover information related to public policy recommendations, and your analytical and statistical skills will help to interpret and process that information. The technical writing skills you cultivated as an ES major will be needed to compose scientifically oriented policy documents.